Grant My Wishes – ALTERNATIVE ROCK BAND/SUPER HEROES. 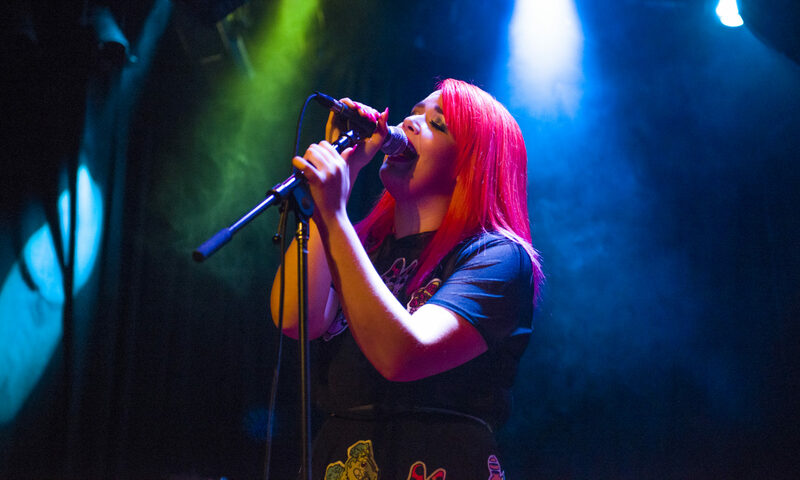 Featuring Jordan Sutton on guitar, Michael Bonanno on drums and Keezy on bass, Grant My Wishes is fronted by an 18-year old Brie Marie and has released independently its dynamic debut album, Relentless. Brie met Jordan through a former Grant My Wishes member. Sensing the group’s potential, Brie and Jordan rebuilt the group by adding Michael and then Keezy. Jordan and Michael had been making music together since middle school and had by March 2013 formed the foundation of the group. They then brought in Keezy, a 17-year-old bass savant, to round out the crew. Relentless became the name of the Grant My Wishes’ debut album for several reasons. For one, it was the original name of the group. But when Brie and the original members of the group realized that several other rock outfits were going by Relentless, they chose Grant My Wishes as a play off the first name of the group’s original drummer. Brie also wanted Relentless to be the group’s album title because it was recognition that despite overhauling its roster and taking two years to record, Grant My Wishes emerged with a remarkable debut album, one that shows the group’s range and its musical depth. The fast-paced “Sounds Like A Lot Of Hoopla,” for instance, showcases Brie’s vocal sass and confidence, while the winning groove and heartfelt sentiment of “Second Finger Sendoff” displays how the group turns pain into infectious energy. Grant My Wishes shows its sonic reach on “One More Night,” one of Relentless’ two acoustic selections. Here, the band channels a real-life experience to create an anthem about having one more chance to make amends. Then, on “The One That Sounds Different (Take It From Me),” the group draws inspiration from the sitcom Friends, which named its episodes as “The One Where…” or “The One With…,” describing that episode. Grant My Wishes slows the tempo down and delivers a sound more in tune with rock of yesteryear. In fact, Brie was drawn to singing because of her early exposure to musicals. Watching them showed her the type of metamorphosis a person can enjoy while performing. In addition to Relentless, Grant My Wishes displays its prowess while performing. With verve and an unyielding energy, the group’s polished live show has earned it opening slots in Los Angeles for Bam Margera, New Found Glory, Unwritten Law, What’s Eating Gilbert, Man Overboard and Hawthorne Heights, among others. The stage has also given the group an opportunity to have another platform where it can gel as it works on new material. Jordan typically starts the songwriting process by crafting music that he then presents to Brie. If she likes it, she’ll write a song to it (she started writing songs when she was 11), drawing from her emotions and her experiences as Michael and Keezy contribute, too. It’s the first time Jordan has written instrumental material that he won’t be singing, a new creative wrinkle that allows him to completely explore his musicality. As a nod to singer-songwriter Bonnie McKee (Katy Perry, Britney Spears), Brie also suggests song titles to Jordan, asking him for a feel or vibe of music she imagines would fit the title. In all, it’s a creative process that sparks innovation and layers that builds on the quartet’s rock-solid relationship. The members of Grant My Wishes indeed draw from a wide range of influences. Michael, for instance, grew up listening to death metal and movie soundtracks, genres which Jordan learned to appreciate largely because of their relationship. Jordan also holds the Beatles and Led Zeppelin in high regard, while Keezy champions ‘80s hair metal and Johnny Cash and hip-hop. For her part, Brie is a product of the show tunes and Broadway soundtracks her mother loved and the oldies such as the Beach Boys and the Beatles that her father preferred. It all adds up to Grant My Wishes, a rock group with a distinctive sound, style and attitude, one that pulls from some of music’s best artists in order to help move rock to its next ideation. And they make memorable music.